You can do SO MANY amazing things with these stamps. Aside from being able to stamp with them, you can use them on so many different surface and other mediums, to create your own color pallets. I love to color with them. For my card today, I am stamping with the distress inks, distressing and coloring with them. I am using Glossy Paper, which gives a lot more play with these inks. They don't dry very quickly. but you can heat set with a quick run of a dryer or heat embossing tool. I am using Halloween Silhouettes, Cloudy Skies and Grassy Hill. The other embellishment which is HUGE favorite are these Candi Dots (Legless Brads)!! The look like brads, but are so much cooler!! LOL!! So I had to use them on my card and pull out more of the color combination on my scene. Hope you like my project today and I can not wait to see your favorite embellishments. Your projects are so unique and wonderful, Calypso! 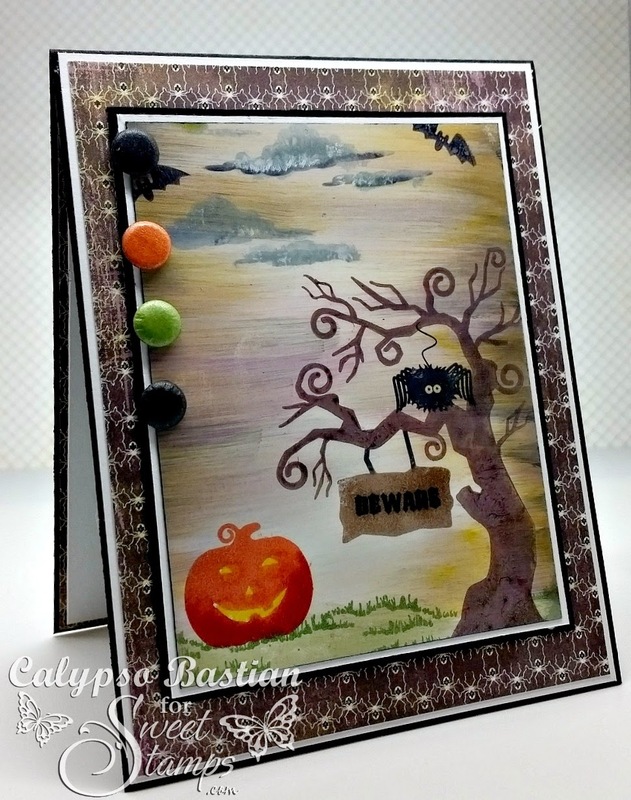 This Halloween card is the perfect mixture of beauty and spooky! Wonderful colors and embellishments! Love your card, love the distressing and your background paper! Thanks for playing along with Mema's Crafts. Wow-I love this card- the background is fabulous- love the eerie feel to it-especially the sky- and LOVE the DP and the brads! Awesome! What a wonderful Halloween card, great job with everything little detail!